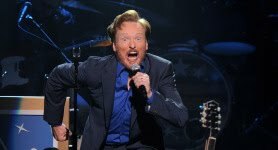 Conan O’Brien’s new late-night series on TBS will have a familiar name to fans of the iconic host. O’Brien’s third late-night show will simply be titledConan when he returns to television Monday, Nov. 8, at 11 p.m. (ET/PT) on TBS. Early in his career, O’Brien helmed the legendary Harvard Lampoon and wrote for television series icons Saturday Night Live and The Simpsons. It was from there that he was championed by Lorne Michaels to host Late Night with Conan O’Brien, where he combined his talents as a writer, performer and interviewer from 1993 to 2008. The two-time host of the Primetime EmmyÒ Awards then took over the reins of The Tonight Show. O’Brien recently concluded touring the United States and Canada with his live show, Legally Prohibited from Being Funny on Television Tour.